13:00 h. Ringing of Church bells to announce the start of the fiestas. 17:00 h. Traditional Valencian ball game. 00:00 h. MACRODISCOMÓVIL DJ JAVI MAS to dance the night away. 12:00 h. Horse and carriage parade with Flute and Drum band. 16:30 h. Traditional Valencian ball game. 21:00 h. Popular dinner in the Plaza with your best APRON, there will a prize for the most original apron. The festeros will give out wine to everyone who is wearing an apron. Sponsored by COOPERATIVA VIRGEN POBRE DE XALÓ. *TICKETS FOR THE COCAS ARE NEEDED TO COLLECT THE COCAS (the tickets can be bought at the Town Hall and local shops. 00:00 h. Dance with “Musical Quartet”. 07:00 h. Wake up call. 10:00 h. BATACLAN Band Parade sponsored by EXCMA. DIPUTACIÓN de ALICANTE. 13:00 h. Solemn Mass in honour of the Virgin, sung by the LLÍBER CHOIR. 14:00 h. Traditional popular races. 21:00 h. “Pasacalle and collection of the festeros and authorities for the Offering to the Virgin. 21:30 h. Solemn procession in honour of the Virgin. At the end of the procession a “TRACA” -chain of firecrackers by CABALLER FX. 00:30 h. Dance with band “LA PATO”. 11:30 h. Collection of the festeros by the BATACLAN, sponsored by the EXCMA. DIPUTACIÓN de ALICANTE. 12:00 h. Solemn Mass in honour of our Patron, Saint Roque sung by the Llíber CHOIR, followed by giving out the BLESSED BREAD. 20:30 h. Street Parade and collection of the festeros and authorities, accompanied by the BATACLAN, sponsored by the EXCMA. DIPUTACIÓN de ALICANTE. 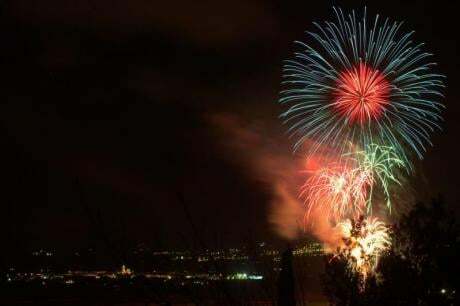 21:00 h. Solemn procession in honour of Saint Roque, Patron of the Town of Llíber, followed by a spectacular firework display by Pirotecnia CABALLER FX. 19:00 h. Fancy dress parade with floats. PLEASE BE ON TIME. 21:30 h. We invite everyone to set up a table in the streets and have dinner. There will be Free Beer for the tables. 00:00 h. Giveaway of the Fancy dress prizes, after the band “Zona Cero” will perform. 12:00 h.Solemn Mass in honour Saint Cosme and Damián, sung by the Llíber CHOIR. 18:00 h. Traditional ribbon races. *Motorbikes and bikes can participate, it is necessary to bring a helmet and a knitting needle. 20:30 h. Street Parade and collection of the festeros and authorities, sponsored by the EXCMA. DIPUTACIÓN de ALICANTE. 21:00 h. Solemn procession in honour of Saints Cosme and Damián, followed by illuminated fireworks by CABALLER FX. 00:00 h. Dance the band “TITANIC”. 12:00 h. Preparation of the Paella´s, afterwards there will be a Water Fight, sponsored by Transportes y Excavaciones MORENO y PEDRO AUSINA vendedor de leña, accompanied by BATACLAN, sponsored by the EXCMA. DIPUTACIÓN de ALICANTE. 00:00 h. MACRO MOBILE DISCO, with the performance of “SPACE ELEPHANTS”. 19:30 – 22:00 h. Bull running. 00:00 – 03:00 h. Bull running. 12:00 – 14:00 h. Bull running. 17:30 h. 3rd Edition of the Llíber competition of the card game “TRES I SOTA”. 19:30 – 22:00 h. Bull running. At 20:30 h. there will be a “Bou Encaixonat”. 17:30 h: Semifinal and the Final of 3rd Edition of the card competition “TRES I SOTA” of Llíber. 00:00 – 03:00 h. Bull running. At 02:00 h. there will be a “Bou Embolat”. ALL BULLS ARE FROM LA PALOMA. WARNING: Minors below the age of 16 years old are completely prohibited from entering the area of the bull running.